What Is a 5.1 Surround Sound Audio System? Surround sound audio is, simply put, sound that completely surrounds you. It means a speaker in virtually every corner of the room, projecting high-quality digital sound at you from all angles just as though you were in a theater. Oh, but there’s so much more. It also means sound diversification, with deep, thunderous bass rumbling the floorboards as an explosion happens on screen, and subtle sound effects skittering and tapping behind you in a suspenseful scene. For music, it’s being purely enveloped by the song you’re listening to. In terms of nuts and bolts, it means a set of speakers, usually five, including the all-important “center speaker,” and a subwoofer for powerful bass. This is where the term “5.1” comes from -- five speakers and a subwoofer. If you're interested in buying a surround sound system, be sure to read the definitions below, as well as the breakdown of how the different parts work. A subwoofer is a large, powered speaker specifically designed to produce bass tones and other low-frequency notes. A subwoofer uses air pressure to create a deep, rumbling sound in order to fill a room with bass noises. Subwoofers are most often placed on the floor in the corner of a room or auditorium for maximum effect across the entire venue. When you’re in a room or theater with loud bass that makes the floor rumble impressively under your feet, that’s the subwoofer you’re feeling. On a PC surround sound system, a subwoofer helps create fantastic bass tones when playing music or a particularly exciting movie. 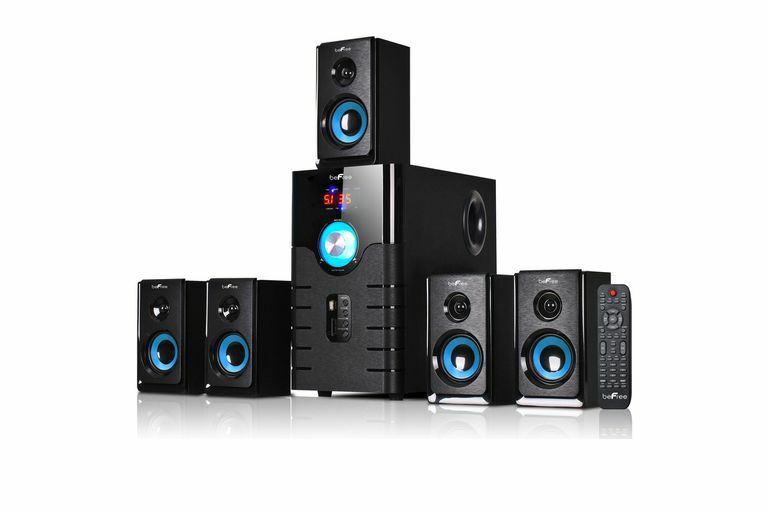 The center speaker in a surround sound system is often considered to be the most important speaker of all the speakers in a surround sound system. Usually larger, more versatile, and containing more individual speaker cones than the other satellite speakers, most of the “important sound” is channeled through this speaker. In movies, for example, this means dialog and other important sound effects. High-quality surround sound systems will have a center speaker that is different from the left and right satellites. A satellite speaker is a general term used for any of the speakers meant to be placed on the left or right sides of the room. In a standard 5.1 system, this means left and right front speakers and left and right rear speakers. That’s a total of four speakers plus the center speaker, which makes five, and then the “.1” represents the subwoofer, which is how the term “5.1” developed. So, 6.1 surround sound means six speakers plus still just one subwoofer. Usually, the equalizer or mixer will just be a part of your PC (or audio receiver, for home theaters). Most computers have built-in equalizers or mixers as part of their sound card output specs, and most audio software, such as iTunes, also comes with its own mixer. On really high-end systems, or on systems which require a lot of power, you may need a separate equalizer as part of a powered amplification system. 2.1 audio systems are not technically “surround sound,” but they are definitely a step up from simple shelf speakers (which don’t have the benefit of a subwoofer). Just as with 5.1 systems, the “2” stands for two satellite speakers -- at the left and right front -- and the “.1” stands for the subwoofer. So 2.1 sound is a great economic solution if you don’t have the money or space for what is called “true” surround sound (at least 5.1 speakers), but you still want high quality, dynamic sound. 5.1 surround sound and better is often referred to, when the system is of a high enough quality, as “true” surround sound. This is because the five speakers allow for two left and right front speakers, two left and right rear speakers (behind your head), a quality center speaker (thus the “5” in 5.1), and a powered subwoofer for deep, rumbling bass tones (that’s the “.1” in 5.1). When digital surround sound signals (such as Dolby or THX) are played through a system like this, you enter a whole new realm of sound, with thundering explosions, dynamic music, and subtle, encompassing sound effects all around your room. 5.1 surround sound is considered the minimum number of speakers needed for true surround sound. Other common configurations include 6.1 (six speakers and a subwoofer) or 10.2 (ten speakers and two subwoofers). The configuration doesn’t matter a great deal and is mostly dependent upon your room size and personal desire. Most audio experts will tell you that above all, you just need to ensure that the speakers are balanced on each side of the room. In a 6.1 system, the extra satellite usually goes at the back center of the room, to balance out the front center speaker.